The day’s run from Darwin through Arnhem land to Borroloola for dinner saw plenty of excitement but presented few problems for the leading Commodores who lost no time. However, the day saw the retirement of Cowan and problems for Carr, Dunkerton and Rowney. Despite the extra 2 hours added to the rest break, it was still an early start on Monday morning with the first car out of impound at 5.00 am and notionally departing Darwin at 6.00 am on the 128 km run down the Arnhem Highway towards Kakadu. With one and a half hours allowed, most crews would take some extra service time in Darwin figuring on making the transport in not much more than an hour. Among the leaders, Rowney and Jackson were each 11 minutes late on the transport, both apparently with engine problems. Carr also needed extra work, presumably on the suspension and/or engine mounts, and was 14 minutes late, as was Mizel. Portman made it by seconds. Losing time on the transport affected scores but perhaps more importantly, cost valuable road position that would put them back among slower cars in dusty conditions. Cowan had broken a drive shaft even before the start of the trial stage and it was not looking good for the Citroen crew. Fury and Bond were certainly still running back in about 33rd and 34th position. Fury was certainly on time and Bond probably was also. Others were not so fortunate needing extra service time in Darwin. Roberts was 21 minutes late, Finlay 30 minutes, Miettutnen 36 minutes and Lockhart an hour and 14 minutes late. Many would not make it at all, cutting to Pine Creek, Borroloola or even Mt Isa. 27 were on time at Control T1. 25 were late at Control T1 while 1 car was early. 44 cars missed Control T1, requiring more service or rest time in Darwin. Some of the later arrivals were basically told by the organiser that they could only stay in the event if they took more rest time and then drove straight to Mt Isa. 3 cars seemingly did not leave Darwiun (Warmbold, Kuss and Haslam). 5 other cars are not shown in the results because they retired somewhere after Darwin and, because they did not hand in their Road Cards, scores were never recorded for them. This included Cowan, Bond and Mason. This was a really nice stage that followed a good gravel road through undulating scrub country for 53 km before turning onto a narrow grotty track which was followed for 43 km to Goodparla Station. The ABC film crew were at Goodparla filming cars as they did a right turn through a gateway. The grotty track continued for about 20 km out to the main Pine Creek Road which was followed for 84 km to Pine Creek. This is now the sealed Kakadu Highway but in 1979 it was a very fast gravel road. The main hazards were wandering water buffalo and you certainly didn’t want to hit one of those monsters. The target time was set at 90 km/h which was too slow, and perhaps the organisers should have either set a tighter time or they might have been better to have stopped the stage where it emerged onto the Pine Creek Road. This was to become a pattern on the division to Townsville and would bring the event significant ridicule from those at the top, especially Aaltonen and Mehta that were banking on some tough stages to make up lost time. So as cars set off into the Kakadu wilderness on a fine sunny day, the road order was Brock, Ferguson, Mehta, Cowan, Dunkerton, Portman, Nalder, Barth, Davis, Carr, Loader, Herrmann, Rowney, Watson and Hilton. Cowan tried to limp through the stage but the Citroen came to a stop once onto the grotty track and his rally came to a sad end. Reddiex had been counselling him to take it really easy but Cowan had not backed off sufficiently. Apparently when the front suspension went to full travel the drive shaft spline would pop out and destroy itself. Dunkerton appeared to take a wrong turn (certainly Nalder, two cars behind them on the road, did not see him stopped) and despite the Commodores, Carr, Portman and Nalder being more than 10 minutes early, Dunkerton actually lost 28 minutes on the stage and had a close encounter with an oncoming timber truck while passing the Giddings Datsun on the road down to Pine Creek. Tuckey suggested he had broken a rear trailing arm but that may be inaccurate as that certainly did happen after Mt Isa. In the end 29 cars cleaned, including all the leaders except Dunkerton. Fury made a strategic decision to book in 13 minutes early in order to preserve road position after no doubt passing quite a few cars. 52 cars completed the stage with Herdy taking a maximum penalty and Cowan retiring. Three and a half hours were allowed for the run down the highway through Katherine to Mataranka and then eastwards to Roper Bar, including 78 km of gravel road. At the end there was an optional refuel which required going 3.7 km past the control to the Roper Bar store and then returning to control. The total distance was listed as 324 km and seemed achievable with half an hour to spare, so most crews stopped in Katherine for fuel and some early lunch. Rowney's overheating problems had become much worse so they changed the head gasket, only to discover that the valve stem was cracked, but they persevered, eventually dropping almost 2 hours late on the transport, falling quickly from contention. Hilton also had dramas and was over two and half hours late. As crews were motoring leisurely south from Katherine they had an instruction at 144 km saying “MATARANKA” then 0.3 km to a 60 km/h sign then about 7 km to the turn left to go to Roper Bar. Well there was just blank highway. It was Marree all over again but this time there was 50 km missing from the route chart. The leading two Commodores appeared to realise the error pretty quickly. Strangely, Mehta and Carr turned around and went the wrong way as if not believing their own eyes. Nalder, with Boyd driving and Richards checking the maps, planted the foot, soon realising that they needed to average at least 140 km/h to make it on time, and they needed to refuel. Portman took longer to realise the error and the Celica zoomed past him. Mehta ended up getting fuel from George Shepheard who was at the start control. The Celica made it with seconds to spare after the 7.5 km return trip to get fuel at the Roper Bar Store. Portman needed fuel and was 10 minutes late at the start of the stage and dropped about 4 positions on the road. Davis reckoned on having enough fuel so he slotted in behind the Nalder Celica who was now fourth on the road behind the three Commodores. Carr had fortunately not stopped in Katherine long and had more time so made the transport on time and slotted in behind Davis, then came the Barth Porsche (also on time) and Portman. Herrmann only dropped a minute and probably slotted in next on the road. Loader and Watson may have been next with Watson dropping 9 minutes. Dunkerton would have been a bit later after his Goodparla dramas, but also dropped 6 minutes on the transport. Roberts was, somewhat surprisingly, 6 minutes early and regained some road position after their late departure from Darwin while Jackson was half an hour late and falling down the road order. Fury was on time and would have been in the next group of cars on the road which may have included Jensen, Hurrey and Giddings. Surely it should have been called “Crocodile Trial Stage” as we don’t have alligators in Australia, but we sure do have crocodiles and this was all crocodile country. The notes for this stage made it sound daunting – 346 km across the south-west corner of the Gulf Country with bull dust and many difficult river crossings with sand, rocks and some deep water. The 6 hours allowed was only a 57 km/h average but no-one knew whether that would be easy or impossible so had to push hard from the outset. It turned out to be very easy with the leading crews about an hour early. This was again the story for most of this division. Why the organisers set such easy times is a mystery but a hint can be found in the Media Guide to the event which said "Ivor Stanelis believes this section is the hardest in the event". One might have reasonably concluded that Stanelis had set much of this division and that he had grossly under-estimated the standard of top competitors. It was a terrible shame as it almost spoilt the event. Initially the stage meandered along the south side of the Roper River on a fairly fast and wide road but with patches of bulldust (or fesh fesh in Dakar terminology). At 88 km the stage turned further south and became a narrow track through scrub. Interestingly, this whole road has now been upgraded and forms part of the Savannah Way tourist route. The first river crossing at 116 km, a tributary of the Towns River, was short and sharp with deep water and a very steep exit. The three Commodores had gotten through OK albeit with some assistance from the practice Commodore which George Shepheard had directed into the stage to shadow and assist the cars if necessary. Nalder's Celica got stuck briefly on the exit and they had to winch for a few minutes. The following cars, Davis, Carr, Barth and Portman, all arrived and looked for ways through, Barth somehow fairing best, but everyone was still behind the Celica. 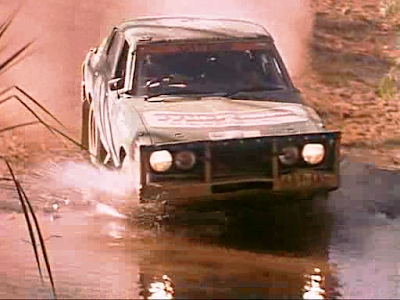 A couple of kilometres later Barth passed the Celica when it became briefly stuck in a washaway. The main Towns River crossing was a further 3 km ahead and was wide, rocky and with a sandy exit. The Porsche got stuck on the exit so the Celica stopped to survey the scene allowing Portman to pass but he also got stuck behind the Porsche. Davis drove around them all without getting stuck, followed by the Celica. The Celica punctured soon after but no-one went past - the other's were still winching. What happened to Carr remains a mystery but according to Tuckey he had broken another engine mount as well as damaging the radiator. Tuckey even suggested he had been lost but that seems very unlikely. Further back Dunkerton had become bogged in the first deep creek but had left the winch in Darwin. They presumably got help from someone else since the road was essentially blocked. Dunkerton also got stuck in the sand at the Towns River together with Fury. Dunkerton apparently let the tyres down but did not have a pump to re-inflate them, and according to the Challenge book, he thought about giving up! However, he got help from a local. Both Dunkerton and Fury eventually cleaned the stage. The next river crossing was the Cox River at 158 km but it was no great drama being short and rocky. It was becoming obvious by now that the conditions were not going to get any worse and that everyone would be pretty early. Brock backed off and stopped at the Cox River to freshen up in the nice cool water. Meanwhile, Gil Davis had passed Mehta and Ferguson and arrived to find Brock stopped. Brock, being a true competitor, jumped back into the Commodore and chased Davis, passing him, until he was told to cool it and let Davis past again. Davis would arrive at the end of the stage first but for no gain as all the leaders (except Carr) were on time. 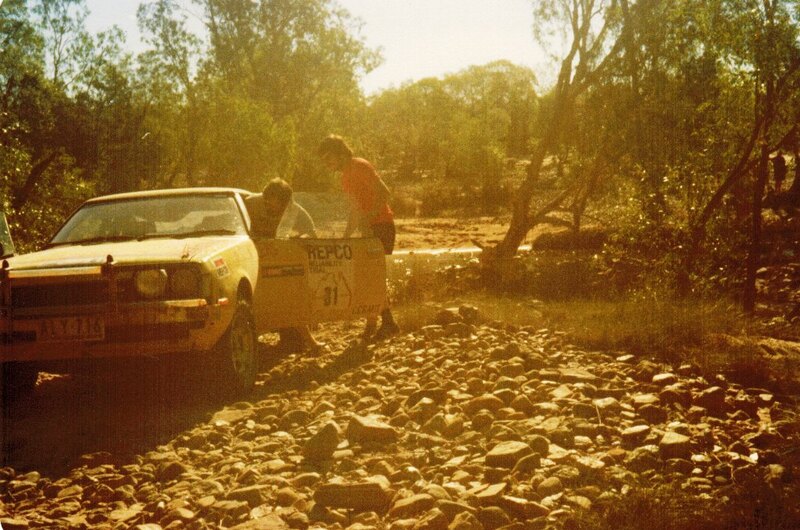 Back at the Cox River, Mehta was stopped with no spare tyres and had to wait for the practice car to catch up. The Celica passed Mehta, and Portman, who having caught up, passed the Celica! It was all splendid fun! According to Tuckey, Herrman passed Mehta and then with Aaltonen driving, they had to nudge the Porsche out of the way in order to repass them and make the stage on time. At 192 km the stage passed the Nathan River Homestead where the ABC film crew had flown in – what a shame they had not been able to access one of the river crossings! After that the track improved into a well graded station track which improved into a reasonable gravel road by the end. According to the Challenge book it was somewhere here that Carr had struck a rock and done some damage to the front end (but he must have also had problems earlier). 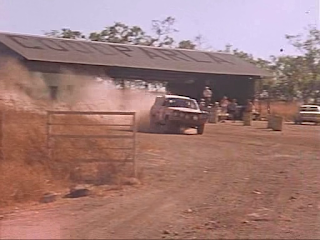 Bond had supposedly hit the same rock and effectively retired on this stage, eventually getting a tow from Tholstrup into Borroloola. It was just dark as the first cars reached the end of the stage with some being up to an hour early and in all, 15 or 16 cars cleaned the stage. Of the leaders, Carr after apparently hitting a rock, dropped 8 minutes, and required an extra 45 minutes service time in Borroloola. Hilton had dropped 8 minutes also and needed more than an hour of extra service time in Borroloola. A total of 36 cars completed the stage under a maximum 4 hours penalty. A further 4 cars (Lockhart, Finlay, Nicholson and Travis) took a 4 hour maximum, which probably meant they went around the long way through Daly Waters, taking a wrong direction of entry at the end. Certainly an additional 20 cars made it to the end of the stage but did not go to the start at Roper Bar. Some of these nipped into the end of the stage from the correct direction as well. 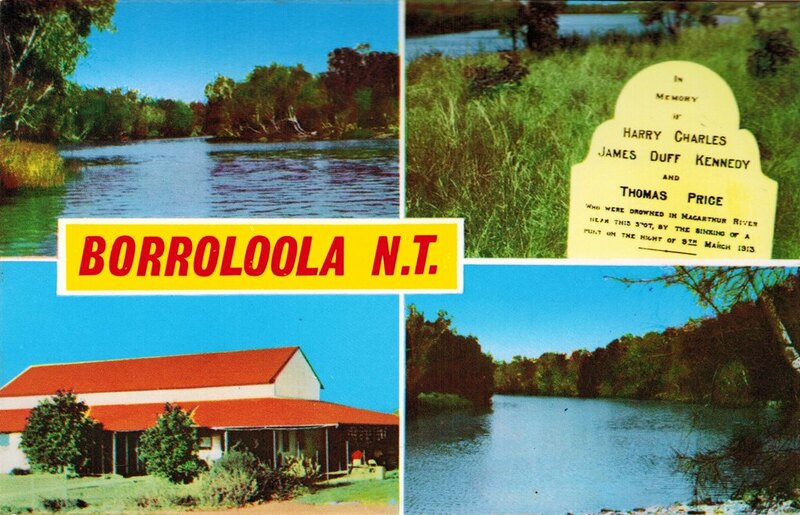 It was 27.5 km into the the small settlement of Borroloola with 40 minutes allowed for refuelling and a bite to eat. There is a big indigenous community here and they were partying and drunk. 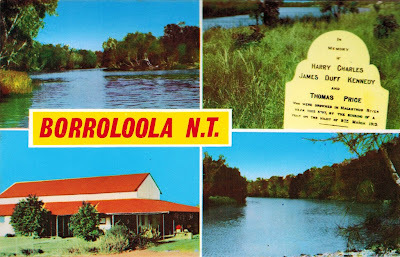 The Borroloola General Store was not much more than a tin shed, but appeared to sell just about everything. A further 3 km took crews out of town over the Macarthur River causeway to the start of the next trial stage on a warm mostly still night. Of the leaders, Mizel was 29 minutes late, Carr 46 minutes late with team mate Fury also dropping 29 minutes, and crucially, road position going into the next super dusty stage. Hilton's dramas continued and the Celica was 1 hour 6 minutes late. Back in the field many others were licking their wounds and deciding whether to venture into the dusty night towards Burketown or to take the easy option of bitumen through to Mount Isa. The McCubbin Monaro was going well again until it hit a horse, destroying the windscreen, and they subsequently limped to Mt Isa for repairs, dropping 3 more controls. We had a really good departure from Darwin with a good breakfast and the car fully serviced, rear axles and bearings changed. The only mishap was that our new tyres hadn’t arrived so we had to make do with what we had on the car and in the service vehicle, but we’d fortunately only had two punctures since Perth and we ended up having only three on the way to Townsville. I worked on the route instructions but could not improve on the organiser’s service points because it was a very inaccessible division. The other two Celicas had arrived and we compared notes. Brian Hilton seemed rather downbeat whereas Peter Hurrey and David Geddes from Hamilton seemed to be having a good time. We headed out of Darwin at 6.15 am just as dawn was breaking. Geoff drove out to the start of the first trial stage on the Arnhem Highway. It was already a hot dry day. At the control Cowan had already broken an axle but headed out in anyway. Portman arrived just as Carr was leaving so only just made it on time whereas Rowney wasn’t there, so we left four minutes behind Portman. Wes drove the Goodparla stage which was fun but easily cleanable. We passed Cowan stopped soon after the turn onto the grotty track. Nearly to Goodparla we clipped the edge of a bloody great washaway but got away with it. There was a bit of a “funny” in the route chart after Goodparla but we pressed on and it seemed to work. Somehow Dunkerton had gone mapping because we got to Pine Creek and he was missing – in fact we hardly saw him again until Townsville! With Dunks, Cowan and Rowney all missing we were up to sixth on the road. We departed Pine Creek at 10.03 am with Geoff driving. At Katherine we stopped for fuel and milkshakes. Geoff kept driving southwards with me navigating and Wes dozing in the back. As soon as we got the “Mataranka” instructions I knew there was a mistake and I just told Geoff to go for it while I figured out from the map just how short the instructions were. I quickly found that we were 44 km short and told Geoff to go as hard as he dare. I was amazed that we passed Mehta and Carr going back the other way (what were they thinking?) and we sailed past Portman and Gil Davis who seemed unaware of the urgency. We needed to average 140 km/h plus refuelling time at Roper Bar. Geoff drove to the end of the bitumen and handed over to Wes who drove the remaining 78 km of gravel road to the control. We really needed to top up the fuel but only had 7 minutes to do the 7 km to the store and back, but we made it! The Barth Porsche arrived at the refuel behind us but no sign of Mehta, Carr, Portman or Davis. Someone at the store had a UHF radio and we heard Mehta saying to Shepherd “there’s a chap at the control that might be able to sell us some fuel” to which George replied “That’s me!”. So Mehta got fuel at the control whereas we passed Portman and Carr coming towards us going very hard while Davis reckoned on having enough. So we departed at 1.34 pm into the trial stage fourth on the road behind Mehta, then behind us were Davis, Barth, Portman and Carr. I was going to drive all of this stage, which was one of the most remote and picturesque in the event. The early parts had a lot of bull dust and we were happy to make plenty of dust! It is like driving in mud and really destabilises the car. We had no dust as Mehta had departed about 10 minutes before us. It was nevertheless very quick until the Nathan River turnoff and at about 115 km we started to descend into the first river crossing. I propped as we saw the MHDT practice car pulling away on the other side, presumably having helped the leading three cars through. Geoff and Wes did a reconnaissance on foot then gave me the OK. We couldn't quite make it over the steep lip on the exit so the guys got the winch organised while I reversed into the solid river and had another run at it. We only had to winch about 2 metres but meanwhile the Porsche had arrived in the creek and was looking for another exit and Carr pulled up behind with Dave Morrow checking out what we were doing with a great sense of panic. I told them to calm down – we’d be out in just a moment. Gil Davis arrived behind and “Skinny” Graham Toner was busy running around in the creek also. We largely ignored the commotion and did our own thing and soon enough we were on our way. About 2 km later I misjudged a deep washaway and got stuck with one rear wheel in the air and we had to winch again for maybe three minutes during which time Barth snuck by. I was a bit peeved that we would no longer have a dust free run but there was more to come! A further 3 km later we reached the real Towns River which is about 100 metres across with high rock outcrops and a long sandy exit. We arrived to find the Porsche stopped with Roland Kushmal surveying on foot, so we did likewise. I waved to Jurgen as we both waited patiently. He got the nod and headed into the river, scraping the sills on rocks then a bit of a splash and out of sight up the exit track. Portman arrived next (what happened to Carr and Davis? ), propped and asked if he could go, I said “be my guest” and he barrelled through and promptly got stuck in the sand on the exit. Maybe were doing the right thing hesitating, but then Gil arrives, doesn’t even hesitate, kicks left at the exit onto another track and disappears! Wes and Geoff indicate to me to follow Gil which I do and only then see that Portman was bogged behind the Porsche. The boys jumped in and we were off. We saw the MHDT practice Commodore there also. We never did see Gil again until the end of stage as he apparently passed everyone! The track continued OK for a long way and was not particularly dusty so we were surprised that we didn’t see either Barth or Portman, especially when we punctured and they didn’t arrive even though we were stopped for a couple of minutes. But at 158 km we slightly overshot the turn right into the Cox River and Portman slipped by. The river was no problem but Mehta was stopped there, out of spares and waiting for the practice car to give them an extra spare tyre. After Nathan River Homestead, where the ABC film crew were stationed, the track improved a lot and we figured that we would be nice and early so we really backed off and with 100 km to go, I handed over to Wes and had a rest in the back. We arrived 45 minutes early and obviously everyone was put back into their original order, Mehta ahead of us and Portman behind Barth. I chatted to Noel who told me about Gil passing everyone. Carr still hadn’t arrived when we departed for Borroloola where the service boys replaced our flat tyre but not much else was needed on the car.